Normal skin is prone to pimple marks, dullness and blemishes due to SKINSTRESS™, caused mainly by hectic lifestyle and external environmental factors such as dirt and pollution. 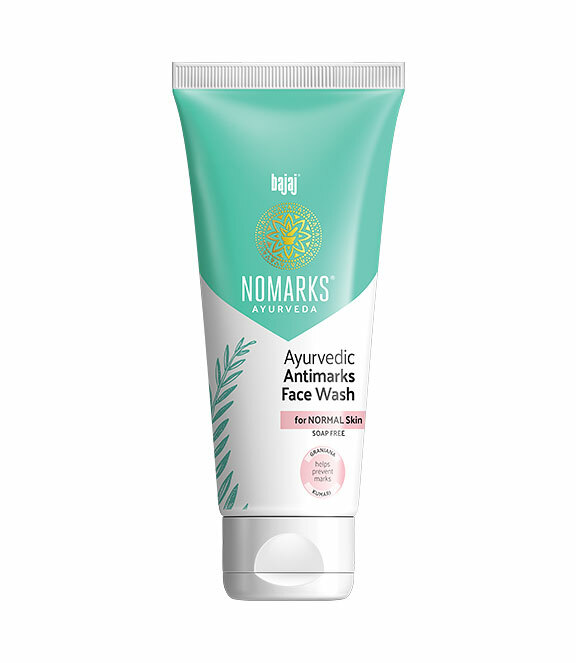 Bajaj Nomarks Ayurvedic Antimarks Facewash for Normal Skin extracts the power of potent Ayurvedic ingredients and helps cure marks from the root of the problem through 2 STEP of the advanced 4 step MARK REDUCTION ACTION. This anti-marks face wash contains Kumari (Aloe Vera), that helps soothe damaged skin and also helps provide relief to marks. Bajaj Nomarks Face Wash for Normal Skin contains Granjana (Carrot Seed Oil) which has powerful antioxidant properties that help prevent marks. Wet your face & Neck and apply face wash.
Gently work up the lather using your fingertips. For best results, follow up with Bajaj Nomarks Ayurvedic Antimarks Cream for Normal Skin. Error: Error validating access token: Session has expired on Monday, 11-Mar-19 23:22:46 PDT. The current time is Saturday, 20-Apr-19 15:37:05 PDT.